This book was desinged to be your single source for CTPAT information and a roadmap on how to build a credible program. The author of this book was involved in the development of the CTPAT program. He guides you through the do’s and don’ts of how to get certified and maintain your certification. 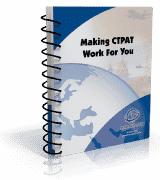 Global Training Center’s “Making CTPAT Work For You” was written by Michael Laden. Mr. Laden has more than 30 years of experience in the international trade industry. He is President of Trade Innovations. Mr. Laden has been licensed by US Customs since 1981. He served the maximum two term limit on the Commercial Operations Advisory Committee (COAC) providing advice on customs matters to the US Treasury Department and the Department of Homeland Security. He is a member of the CBP Trade Support Network (TSN) which is currently designing the next CBP computer architecture known as ACE (Automated Commercial Environment). He was the executive sponsor of a direct-filing program for customs entries (>200,000 entries annually) and helped a mass retailer achieve the coveted ISA designation. Mr. Laden is also credited with developing some of the most creative and ingenious customs compliance programs, policies and procedures; allowing his employer to achieve unprecedented levels of compliance, while lowering associated landed costs.